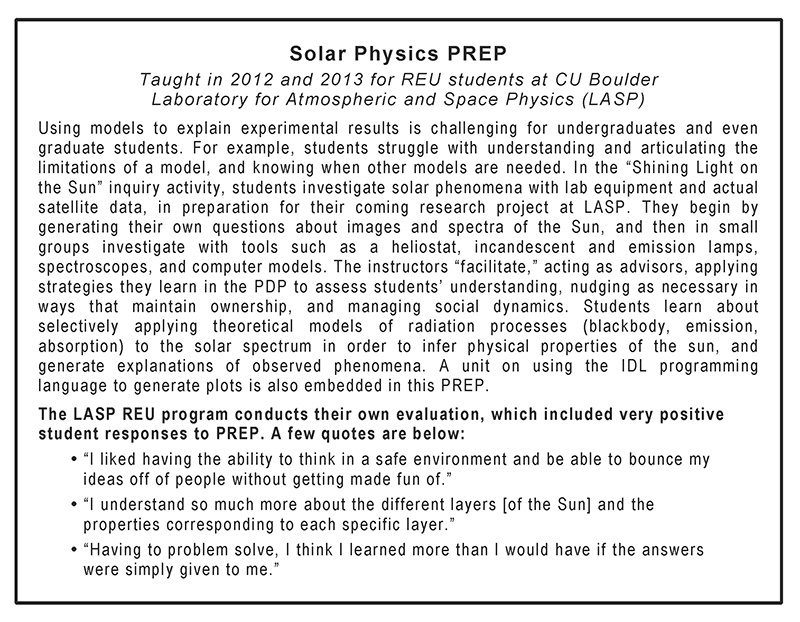 ISEE PREP is designed to prepare undergraduates for research experiences in science, engineering, or technology fields. ISEE offers PREP in a range of fields customized to prepare undergraduates for the particular skills, background knowledge, and social-cultural norms that will make them successful in their coming research experience. PREPs are designed and taught by a small team of participants in the Professional Development Program (PDP), often graduate students and postdocs. This team of instructors works with the mentors and/or program staff managing a research experience curriculum to identify background knowledge, skills and attitudes that will help undergraduate researchers to successfully integrate into the research environment and be a productive researcher. PREPs can be 1-5 days in length depending upon the identified needs and availability of the PDP instructional team. PDP teams are invited to design and teach PREPs, which typically take place in the early spring and summer. Participants need to either work with ISEE or AWI to find a program that requests a PREP instructional experience, or to identify their own venue. Possibilities for PREPs include research experience programs that already have a group of incoming students, or a group of advisors that individually host undergraduate research students and collectively include ten or more students. Further information on PREPs and ideas for activities can be provided upon request. Programs or clusters of advisors can arrange for a PREP to be developed and taught by PDP participants, in consultation with ISEE/AWI staff. Hosts of PREPs are expected to define their own student audience, handle all student logistics, meals and housing, and work closely with a PDP team to integrate PREP into the overall research experience of the students. A small instructional fee is required and will be negotiated with ISEE. Those interested in hosting a PREP should contact ISEE to discuss ideas and costs.